It Doesn’t Matter how Pretty Your Website, if it Doesn’t Convert Visitors Into Customers. Website design is important, but it's only one part of the equation because to beat your competition you're website has to convert better than theirs. Effective lead generation consists of two parts: tactical and strategic. All the design and grunt work that goes into search engine marketing to generate highly qualified leads is the tactical side (submitting to local directories, link building, blogging, etc.) But the strategic component is what causes your website visitors to reach the conclusion that they would have to be absolute fools to do business with anyone else but you. This is where the rubber meets the road, because while your competition is intent on impressing website visitors with glitzy design, you can dominate your market with strategic content that converts twice as many leads for the same money spent on advertising. The formula is this: Traffic + Conversion = Profit. We call it scientific advertising. 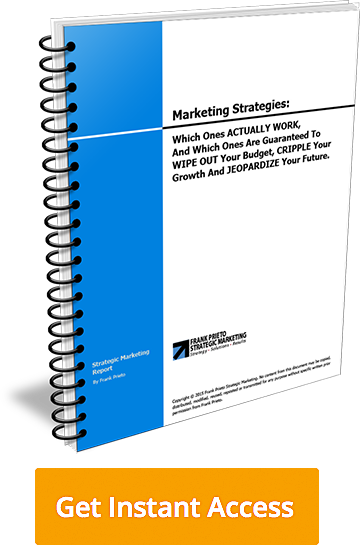 If you want to discover the secret sauce to dominate your local market, grab a copy of The FREE Report. -- It's all spelled out for you in black and white so you can implement it yourself or hire us to do it for you. In today's online world, internet marketing has become the new king of media. The Yellow Pages have gone the way of the milk man and elevator operator, because technology has changed the way we buy goods and services today. Search engines like Google and Bing are the Yellow Pages of today, and you can say Facebook is the new 'word of mouth' advertising.